Spain is Edging Closer to a Bailout! Unless you’ve been too caught up in the NFL referee lockout drama, you should know that Spanish news have been dominating currency price action lately. Remember that Spain, the euro zone’s fourth largest economy, is under pressure to tap the ECB’s coffers by officially asking for a bailout. After all, the country is facing not only the highest unemployment rate in the region, but also ridiculously high borrowing costs and a financially troubled banking system. Investors are worried that Spain will soon default on its debts if the government doesn’t act on its problems. But Spain’s officials have been dragging their feet as they believe that a bailout would lead to more austerity conditions for Spain. Well, the government is definitely not stalling now! In a move that is seen as preparation for a bailout request, Prime Minister Mariano Rajoy recently presented their plans to reduce the country’s budget deficit. From a deficit of 6.3% of GDP this year, the government is targeting a deficit of 4.5% in 2013 and 2.8% in 2014. Recall that under the region’s Stability and Growth Pact, the EZ countries are required to limit their budget deficit to only 3% of GDP. The government is planning to raise 39 billion EUR by cutting government spending by 8.9% and freezing the salaries of civil servants for the third year in a row. They’re also increasing some minor taxes, which are estimated to bring an extra 4.4 billion EUR next year. In addition, the government has promised to set up an independent agency that would monitor budget policies. But that’s not all! Yesterday Spain rolled out its bank stress test results, which showed that 7 out of 14 Spanish banking groups need additional capital to the tune of 59.3 billion EUR. That’s a bit below the 62 billion EUR figure that analysts were expecting and a heck of a lot smaller than the ECB’s 100-billion EUR budget. The currency bulls were initially cheered by Spain’s actions. EUR/USD jumped by a whopping 100 pips in the first 3 hours after the release of Spain’s budget plans, while Spanish bond yields ended Thursday below its 6% highs. Apparently, some believe that by showing promising budget plans and stress test results, Spain would have more bargaining chips on the bailout table and avoid harsher austerity conditions. But not everyone is impressed. 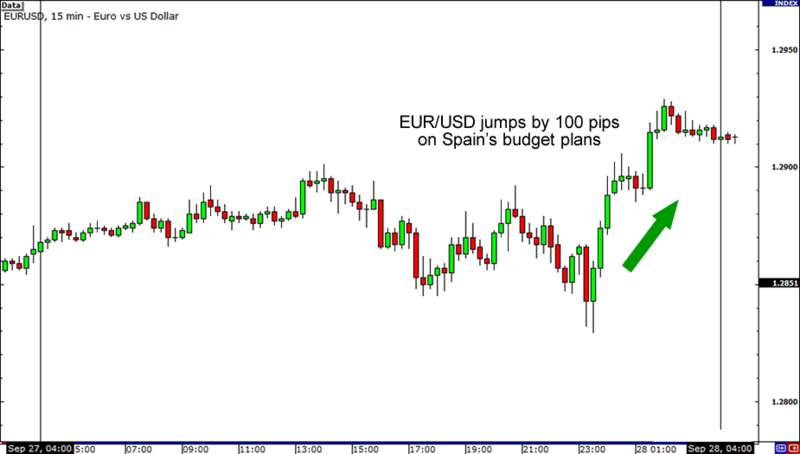 Naysayers point out that the Spain’s officials had been too optimistic in their estimates. At the economy’s current conditions, there would be more people collecting social benefits and less people paying taxes by next year, making it difficult for the government to meet its deficit targets. Besides, Spain’s budget plans aren’t even final yet. The proposal is expected to go through Parliament today and the debates could last for weeks. If the Parliament does approve of the plans, all 17 Spanish regions would still need to cough up 5 billion EUR worth of savings each. Lastly, they would need to convince AAA-rated countries like Germany and Finland that their plans are enough to meet their deficit targets. Talk about a tall order! Will a Spanish bailout end Spain’s problems?